The work of Agatha Christie is enjoying something of a renaissance at the moment, with Kenneth Branagh's Murder on the Orient Express currently playing in theaters worldwide, with a sequel on the horizon. So it's not really surprising that Julian Fellowes, our foremost chronicler of the travails of the British upper crust, would tackle a Christie novel for the screen. After all, Fellowes won an Oscar for his screenplay to Robert Altman's Christie riff, Gosford Park in 2001, so this seems like a natural fit. Unfortunately, Crooked House isn't nearly in the realm of Gosford Park, nor is it in the realm of Fellowes' celebrated TV series, Downton Abbey. It feels like a TV movie, but not in a good way - a kind of PBS movie of the week that is lost amid a swirl of sumptuous costumes and lavish sets. Set in a country estate in the 1950s, CCrooked House is the story of a wealthy British family torn apart when their elderly patriarch is murdered, and the prime suspect is his new young wife, Brenda (Christina Hendricks), a former dancer who has always been regarded with suspicion by the rest of the family. Skeptical of this narrative, his granddaughter, Sophia (Stefanie Martini), enlists the help of former flame and private investigator, Charles Hayward (Max Irons), to solve the crime. Once he arrives at the estate, however, he discovers a den of vipers all out for themselves, and all with potential motives to kill in order to reap the benefits of their impressive inheritance. But as evidence continues to mount against Brenda, it becomes clear that she is either a murderer, or is being framed by an especially devious mind. Crooked House builds to an undeniably surprising conclusion, but not before slogging through a lot of mundane build up that never really leads anywhere. Fellowes and director Gilles Paquet-Brenner send us scurrying down rabbit holes as they introduce the large ensemble. 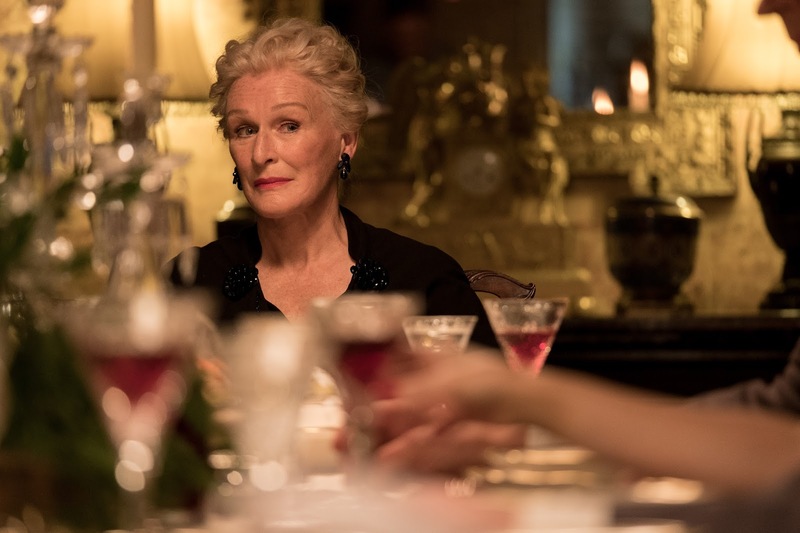 The problem is that there are only two characters who are particularly interesting, save for Glenn Close's imperious Lady Edith and Gillian Anderson's boozed-up former actress, Madga. Both are clearly having a grand old time chewing the scenery, and the film comes alive every time they're on screen. Regrettably, the rest of the film can't come close to matching their energy, and they almost seem to be acting in a completely different movie altogether. That is, at least until the film reaches its melodramatic conclusion. They may brighten up their drab surroundings, but they can't save a film that feels like a weak episode of Poirot rather than a stand alone feature. It's certainly a deliciously dark tale, but it never really gives into its sordid, over-the-top tendencies until it's too late. 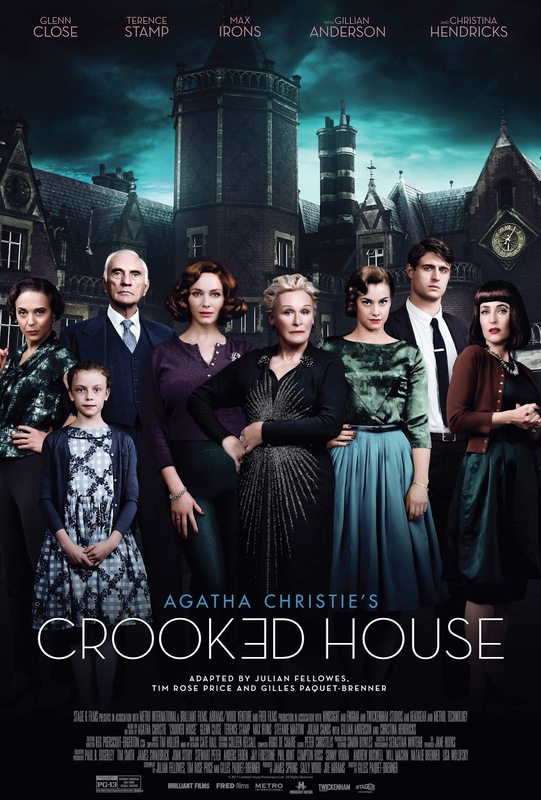 CROOKED HOUSE | Directed by Gilles Paquet-Brenner | Stars Max Irons, Stefanie Martini, Glenn Close, Honor Kneafsey, Christina Hendricks, Terence Stamp, Julian Sands, Gillian Anderson, Christian McKay | Rated PG-13 for thematic material and some sexual content | Now playing on demand. Opens in select theaters on Dec. 22.